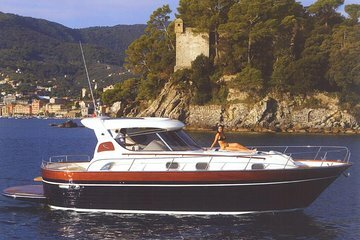 Trascorri una giornata indimenticabile navigando su e giù per la pittoresca Costiera Amalfitana in Italia con questo tour di una giornata in barca da Napoli. Goditi il sole mediterraneo sul ponte e rinfrescati con le soste per nuotare e fare snorkeling. Goditi il tempo libero per esplorare le colorate città portuali di Positano e Amalfi e brindare al mare con una dolce degustazione di limoncello e happy hour. Dirigiti verso l'Hotel Terminus nel centro di Napoli al mattino e fai un giro panoramico lungo la Penisola Sorrentina con un minibus. Assicurati di portare un costume da bagno, un asciugamano e una crema solare, oltre a una fotocamera per scattare foto della pittoresca costa. Incontra il tuo capitano ed equipaggio, e poi sali a bordo della barca al porto di Piano di Sorrento. La dimensione del tour è limitata a 12 per un'esperienza più intima. Prendi alcuni raggi sul ponte mentre percorri la Penisola Sorrentina, passando per le affascinanti enclave costiere di Marciano, Mitigliano e Bagni della Regina Giovanna, dove getterai l'ancora per una nuotata rinfrescante e una pausa per lo snorkeling. Ammira le viste stellari dell'isola di Li Galli e Nerano, tuffati in acqua con una sosta per lo snorkeling a Praiano e scendi alla scoperta della Grotta dello Smeraldo (ingresso non incluso). Fai un altro approdo nella bella Positano - conosciuta come la "perla di Amalfi" per la sua ambientazione da cartolina di case colorate che si riversano su una scogliera rocciosa. Goditi 2 ore di tempo libero per passeggiare per le strade ripide e tortuose e sfoglia i negozi locali, quindi continua lungo la panoramica costa oltre il Fiordo di Furore fino alla città di Amalfi, dove avrai altre 1,5 ore di tempo libero per fare shopping, cenare, ed esplorare. Tornati in barca, rilassatevi e ammirate gli spettacolari scenari che si susseguono durante la crociera di ritorno a Piano di Sorrento. Festeggia un viaggio di successo con un happy hour e una degustazione di limoncello prima del viaggio in autobus di ritorno per Napoli, dove verrai ricondotto al punto di partenza la sera. This was amazing! Loved the trip and our boat guide was great! The only complaint for the entire day is the transportation to and from the boat. The bus driver was grumpy and there was no air going on the bus. On the way home, he just dropped us off at a bus stop and left. We had no idea how to get back to our hotel and ended up walking 2.5 miles in the dark as we could not locate a taxi. Super unprofessional! Make sure to have plans on how to get home. Great day out on a nice big motor boat cruising to Positano and Amalfi. The organizing once you get to the docks is a little chaotic by US standards, but it the all works out and you get in your boat by around 19 an—pay attention to what’s going on and it’s fine. Great boat tour. The pickup and drop off to the cruise port was a little confusing because of the lack of communication about what was going on. At one point we stopped at a hotel to pick other people up but the drive just disappeared for 15 minutes without telling us why we had stopped. Once we got on the boat the cruise was great, but felt a bit rushed. There were 2 opportunities to jump off the boat and swim. Beer and wine was provided at each of the swimming stops. We were given an hour and a half at amalfi and an hour at positano, not as much time as was they said in the description . Also, the limoncello tasting was not provided at the end. Overall, it was a good tour, but it just felt a little rushed and not everything was as stated in the tour description. This is a very good trip and deserves a great review. I hope this review gives others the confidence to see Capri via this perfect little tour. Firstly, this method of getting to and from Capri is amazingly good value for money when compared to either the cost of the ferry or hydrofoil. And, you get to travel much more exclusively - with just a small number of others on a private boat. Throw in the fact that you'll receive a boat tour of the entire island and get to see all the grottos and navigate through the Faraglioni as well, what's not to love! So, we were picked up in Sorrento at the agreed time and location via a small, modern minibus fitted with lap belts. We then had a short 10 minute ride to get us as close as possible to the small, beautiful harbour - with just a short walk, a lift ride down to the harbour and a further short walk to the checking-in office. From getting off the bus to getting on the boat was probably about 30 minutes all in. We boarded our boat there were just 10 people in total on our boat, although the maximum is only 12 and commenced our boat ride across to Capri. Sitting aboard the boat while the captain navigated the sea felt really special - and far better than being on a large ferry or hydrofoil with 100's of others. Once we arrive at the Capri harbour we were given a short briefing about finding our way around Capri and we then alighted with just short of 4 hours of free time to explore. For us personally, this was sufficient time to 'dip our toes' into Capri and get a feel for the island. If you really wanted to explore both main parts of the island you would need longer than this tour provides. Our captain collected us promptly at 1:45pm from the allotted place in the Capri harbour and then began the next part of the tour. Our boat navigated around the entire island and although the boat was not able to enter the blue lagoon as you have to enter on much smaller boats we went into both the green and the coral grottos and navigated through the Faraglioni rocks to the sounds of Amore by Dean Martin. Having kissed my new bride under the arch of this beautiful rock, we were assured of ever lasting love! All in all, I think from start to finish the total trip was approximately 8 hours from pick up to drop off. This was a brilliant tour choice. The tour company was very professional and we received excellent communications from both Viator and the tour company from the moment we booked. The coach and boat seemed modern and in superb condition and all the staff involved throughout each element coach driver, the staff who escorted from and then back to the coach, the checking in staff and the captain were friendly and helpful and looked after us throughout. As stated in my introduction, this was also exceptional value for money and I cannot recommend this tour more highly. The coach trip was long because of the traffic, didn't like the fact that the driver never stopped messing with his phone for the 1hour and half he was driving,and when we got to where we pick up the boat in Sorrento,that was not organised at all well,one toilet dirty at that,and there were lots of people,that bit was so badly organised, herded along like cattle,but when we got on the boat it was amazing,the guy who took us was friendly,we had a great time,couldn't fault it at all. If I could give this tour ten stars I would . 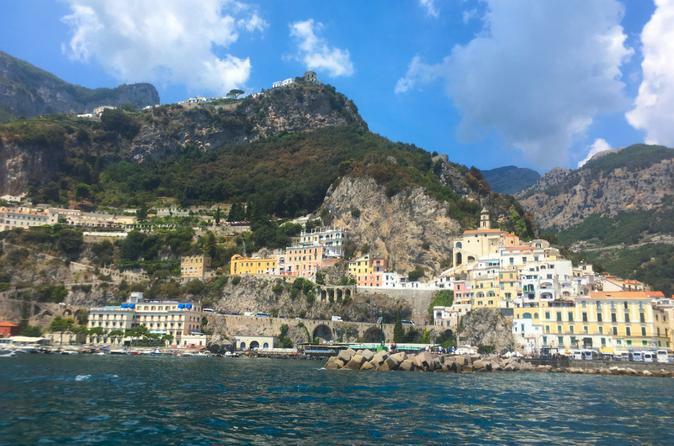 The cruise on the Mediterranean and swimming in the Mediterranean was the highlight of our tour to Italy and one we won't soon forget. Our boat driver Andre was helpful in pointing out key spots. They were even great in accommodating our return to the port so some in our party could catch their cruise ship and we could catch our train back to Rome. It truly was a full day. 8 am to 7 pm. Absolutely would recommend. I give this the highest rating allowed and I am a hard critic to please!!! Maximum of only 12 people, so perfect way to see Positano and the Amalfi Coast! Fabulous captain, fun music, really full day of enjoying the crystal clear blue waters of the coast in Italy. Breathtaking! We only stopped once to swim, but otherwise the best possible experience! Beautiful Day on the Water, would have like a little more swim time, and a little more organization from the time we were dropped off until we got on the boat. Really loved the scenery on this trip, but would have enjoyed a little more catering experience, with wine and cheese platters etc. Plus would have loved more swim time, but over-all the trip was beautiful and the captain was nice.